If just one Rochester city streetcar system car could be whisked from the 1930s to today and plunked down at NYMT, ROCHESTER STREETCARS might just pick line car 0105. Forget all the wonderful passenger cars, or the relics which had once been passenger cars in the 1890s but were still toiling away as sand cars such as NYMT's 0243. Forget, too, the sleek Subway cars such as RGVRRM's car 60. Without an overhead, all the trolley cars of Rochester's past would just be stuck in the barn. And, a line car is the essential workhorse, needed to build and maintain overhead. 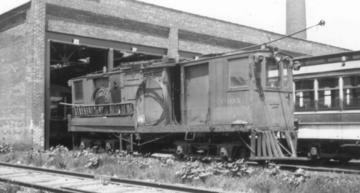 Car 0105, built for the Rochester and Sodus Bay and originally numbered 910, spent the first half of its career maintaining interurban overhead to Sodus Point on the Sodus line and, after about 1906, to Geneva on the Rochester and Eastern. A wooden tower in the car's middle was used by linemen to reach the overhead. The body of the car was surely filled with all imaginable overhead repair parts. By 1930, the R&SB and R&E lines were abandoned, but 0105 found new work on the many miles of the two-, three-, and even 4-tracked, 8-mile-long Rochester Subway. In our present photo, we see 0105 at East Main Station sometime in the 1930s, judging by the white safety stripe on the passenger car in the background. After 1941, 0105 and a small collection of work cars would find permanent homes on the Subway, and be located in various years either in the underground section in downtown or at the Subway car house at the line's west end. The end came in the summer of 1958 when the work equipment was finally scrapped at the Subway car house, nearly a year after the end of trolley freight service on the Subway. It was almost as if Rochester Transit Corporation knew NYMT would be formed a scant 15 years in the future and might like a line car, or a rotary snow plow or even an electric locomotive or two. For ROCHESTER STREETCARS, today's choice of that one car to have saved is 0105, but maybe this is only because of the countless hours spent in a bucket truck by this writer twenty feet above the ground doing overhead work. On other days, city car 437 or any Rochester and Eastern car come to mind. So, readers, the question is posed: Which Rochester streetcar would you have saved, intact and ready to run, for use at NYMT if you could have done so?